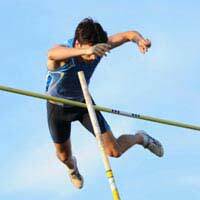 Pole vault is arguably the most technically demanding track and field event of all. World class athletes can make it look effortless as they glide over the bar, but get it wrong and an athlete risks serious injury. Bobby Templeton was a rising star in the sport until an accident wrecked his chances of reaching the top. “Because I was feeling so good, I decided I would push myself by gripping the pole a little higher. I remember the run-up being smooth and I planted the pole in the box perfectly. I drove through the pole and swung my trail leg through.